That’s right, A new front door will give you the biggest bang for your remodeling investment. After all, you only get one chance to make a first impression. And what else is the first thing people see when entering your home? And you won’t need to drain the piggy bank to do it. According to a recent survey, Realtors® across the country said a steel entry door would return 101.8 percent of its costs. In fact,, this is the only project that had a positive return on investment. 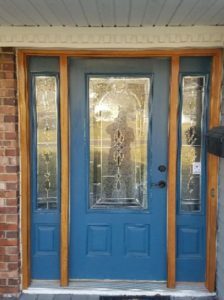 When you replace the front door, there’s a relatively low cost involved. A basic steel door can be purchased for under $200.00, plus installation. Of course, nicer doors cost more. Consequently, the low replacement cost may be why it’s almost always at the top of the annual list of remodeling projects that recoup their cost. The survey compiles the opinions of Realtors® in addition to delivering estimates for the average cost of popular home renovations. This is a great starting point if you’re looking for info about home remodeling costs in addition to potential returns. However, but nothing beats having knowledge of the local market. Here’s the trick to getting a good return on your investment in remodeling. You want to keep up with the Jones’ while never surpassing them. You won’t recoup the cost of custom moldings and a coffered ceiling in an entry-level home. Likewise, when you replace the kitchen floor of an upscale home, don’t use vinyl squares. Because this will turn off the luxury buyers.